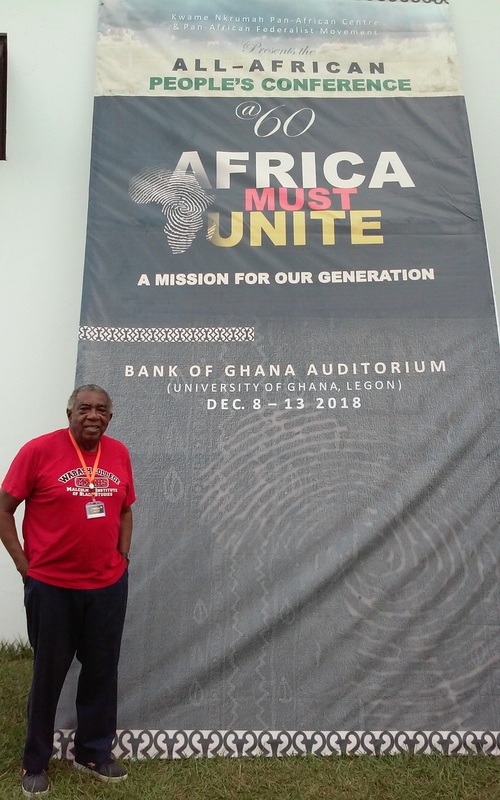 A. Peter Bailey stands in front of conference sign in front of the University of Ghana. Here, I am with Malaak Shabazz, daughter of Brother Malcolm X, who is standing with Michael Flores, a delegate from Belize. 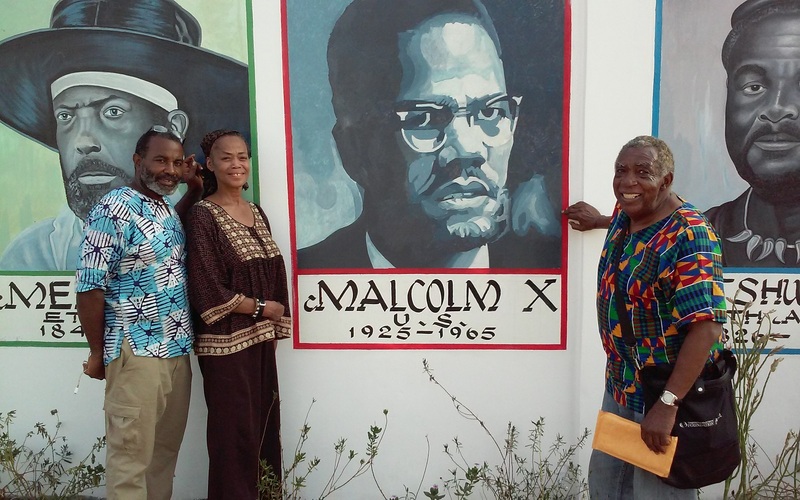 Brother Malcolm here, is included in what is called, "The Wall of Ancestors", created by Jerry Johnson, an African-American who lives in Ghana. (TriceEdneyWire.com) - About three years ago when Joomay Odongo Faye first introduced me to a new Pan African organization of which he was a co-founder, I had no idea that the introduction would lead to my going on an airplane for the first time in 33 years. I was already a Pan Africanist, having been guided into being one by Brother Malcolm X, the master teacher. Joomay told me that the Pan African Federalist Movement’s members from twelve regions throughout the world were talented, resourceful, committed people of African descent who are totally committed to the concept that Africa must unite. The twelve regions are West Africa, East Africa, South Africa, Central Africa, North Africa, North America, Europe, South America, the Caribbean, Near East, Middle East and Far East. The five official languages to be used on PAFM’s international documents are English, French, Ki-Swahili, Arabic and Portuguese. When we landed in Accra on the morning of December 7, 2018, after a direct flight on South Africa Airways, it was a deeply emotional experience for me. Though I had visited East Africa—Kenya, Uganda, and Tanzania—and Cairo in the 1970s, it was from West Africa that my ancestors had been captured and taken to enslavement in North America. I also had knowledge expanding conversations with Pan Africanist from Senegal, Mali, Germany, Burkina Faso, Jamaica, South Africa, Guinea, England, Liberia and the Virgin Islands. Other than North American delegates included Malaak Shabazz, one of the daughters of Brother Malcolm and Sister Betty, Mwalimuk-Q Amsata, coordinator of the North American Region, Jacquiline Johnson-Dickson, who is another frequent traveler and Mobantu Ankoanda, who last fall celebrated the 20th anniversary of her Collard Greens Cultural Festival in Lithonia, Georgia. She told us about her collard greens ice cream. Also memorable was conversing with several former residents of North America who now live in Ghana. They included Jerry Johnson, founder of the knowledge expanding Global African Ancestral Wall, an over block-long wall featuring 88 large painted portraits of people of historical significance who are of African descent, Kwame A. Mitoto Sr., who took Malaak, Jackie, Mobantu and myself to breakfast at one African restaurant where we were served delicious yellow grits that were made in house. For me, the most deeply emotional experience of the trip was going to the fortners El Mina were thousands of our African ancestors were held in captivity until being forced to go through the Door of No Return to be put on ships that would take them to enslavement in North and South America and the Caribbean. When hearing about the major role played by the Catholic Church at El Mina, I thought that, to some degree, it’s retribution for the despicable, horrific contribution Catholicism and Christianity made to the enslavement of millions of African people.